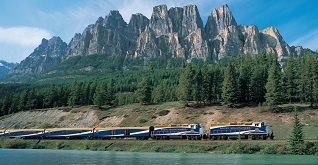 This flexible, scenic rail and drive package includes unlimited mileage with a full size rental car, two days on the Rocky Mountaineer and five hotel nights. It’s ideal for exploring at your own pace within the structure of a package that looks after all the details. Consider extending your stay in the Rockies and include a drive along the Columbia Icefield Parkway, considered one of the three most scenic highways in the world. If you want to make the most of your trip, consider trading your night in Calgary for an additional night in Banff or Lake Louise. There may be an additional charge connected with this change. 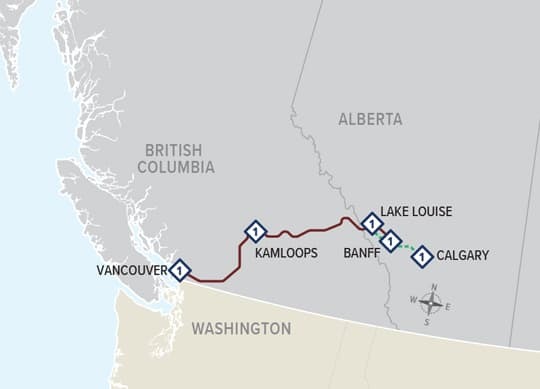 The First Passage to the West Discovery Self-Drive is available on select dates between April 14 to October 10, 2019. Call 604-990-9299 or 800-913-9207 or Email us for more information and reservations. Prices depend on when you travel, number of travelers and train service you choose. Call 604-990-9299 or 800-913-9207 or Email for more information and reservations. SilverLeaf Service includes reserved seating in a custom built single level car with expansive windows curving into the ceiling, hot breakfast and lunch served at your seat, and complimentary alcoholic and non-alcoholic beverages during the day. GoldLeaf Service – Reserved seating in the GoldLeaf elevated dome car. Breakfast and lunch are served in the GoldLeaf dining car and GoldLeaf passengers have access to the outdoor viewing platform. Alcoholic and non-alcoholic beverages are included.